Maybe it's just my usual cantankerous nature, but it is so much easier to complain than to say nice things. Which is why discussing Louis, the restaurant, for a second time is so boring. I must admit, there is nothing to complain about when it comes to Louis. 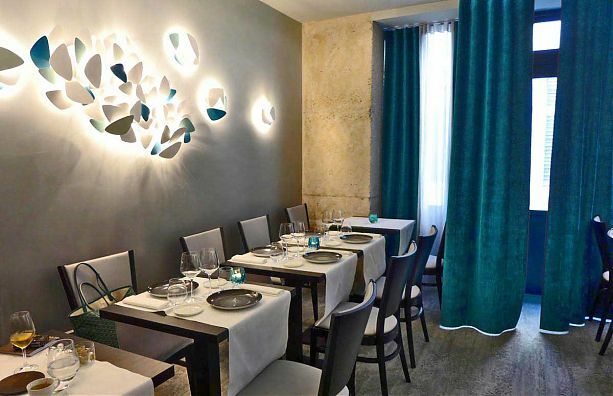 I came to that conclusion last June, shortly after the restaurant opened, and I again conclude that the folks behind this small, quiet establishment in Paris 9 just about do everything right. The food is fresh and interesting, the service impeccable, the prices reasonable, the wine list is well-composed, and despite the small room, it is possible to have a conversation without other patrons listening in on more than half of what you are saying. There are positive reviews of Louis to be found, but not a lot of buzz - this is a quiet success story, so far. Hell, it's not even included in the 2016 Le Fooding guide, a serious lapse on the part of that otherwise stalwart reference. Given that I've already reviewed Louis fairly recently, I'll just illustrate the meal that Co. and I had a couple Friday evenings ago. If you want more details, you can scroll down to the bottom and click on where it says 'Older Posts' to reach my June 2015 review. Just to remind you, at Louis you have two choices - six courses (48 euros) or eight (62 euros, including a cheese dish). Our 2012 Languedoc (Montpeyroux Sylvain Fadat) was priced at 37 euros. An amusing amuse bouche to start off - the third in the row is a polenta cube beside its accompanying vinegrette. The final amuse bouche - poached egg and something, something. (Another blurry one ..) Foie gras with light-as-a-feather brioche for dipping. If you went with the 6 course menu, you wouldn't have gotten this one, a serious loss. A subjective look at dessert 1, reflective of the amount of alcohol I had consumed prior to getting there, but much, much clearer in real life. For good measure, some extras, minus the one I already consumed. And not mention the little plastic doggy bag with some more patisseries for Co., a sexist discrimination of the worst sort. Before bringing this one to a close, I have to complain about something, despite my saying I had nothing to complain about. As is the case in many Parisian bistrots (and, no doubt, beyond), whose carte is comprised of a tasting menu and often nothing else, the courses are not listed, but are left as a surprise. What am I four-years-old? If I'm shelling out 150 euros or more for a meal - however terrific it might be - I'd prefer to know up front what I'm paying for. But I guess that's an idiosyncratic quirk that you are likely to view as reviewer nitpicking, or worse. So forget I mentioned it. Did I say that I really like Louis (the restaurant)? Don't forget that.